Stand for the Troops (SFTT), the David Hackworth legacy foundation, is Saluting Service Dogs with a photo campaign launching on PTSD Awareness Day, June 27th, 2018. 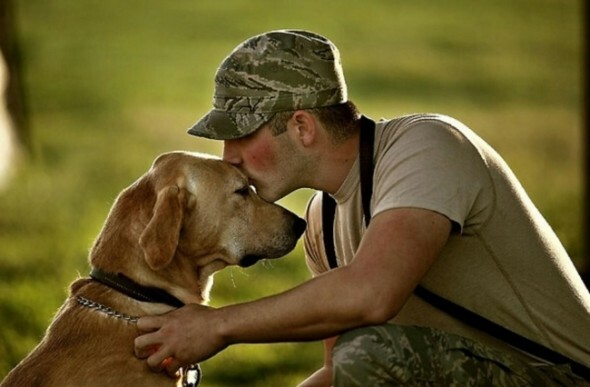 Veterans and their families are encouraged to submit candid or portrait photographs of themselves and their service dog companion along with a short narrative about WHY this canine relationship has reduced the symptoms of post-traumatic stress (PTSD). The campaign will conclude on September 6th, 2018 when one Veteran will be selected to receive a year’s supply of Dog food. The announcement will be made at the Frank J. Robotti Golf Classic luncheon and recipient does not need to be present. While the US Department of Veteran Affairs (VA) acknowledges that owning a dog can “lift your mood” and that “All dog owners, including those who have post-traumatic stress disorder (PTSD) can experience these benefits,” the VA still doesn’t acknowledge the value, both psychological and monetary, of canine companionship to Veterans. The good news? The Contemporary Clinical Trials has designed the first-ever study to quantify the palliative effects of service dogs for Veterans who suffer from PTSD. But the SFTT Medical Task Force doesn’t need a trial to know how restorative the relationship between a transitioning serviceman or woman and his/her service dog can be. Whether you’re recently separated from active duty or you’ve been a civilian for many years, we recognize the impact these animals have had on your lives, which is why we fund service dog programs throughout the US. SFTT’s Service Dog Salute Photo Campaign is about you and your service dog. We know that so many Veterans have experienced the therapeutic benefits of having a PTSD service dog and we want to hear about — and see — your unique relationship with your canine. Submit your Story and High Resolution Digital Photo to info@SFTT.org and we’ll post both your story and photo. Dog Food recipient will be notified by phone so be sure to include name, address, email and phone number with your submission. By submitting your story (500 words or less) and a photo of your battle buddy, you agree that it can be posted in its entirety along with any images on SFTT social media streams and SFTT.org.